Radiation from Jupiter can destroy molecules on Europa's surface. 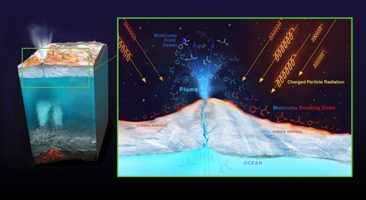 Material from Europa's ocean that ends up on the surface of Europa will be bombarded by radiation. The radiation breaks apart molecules and changes the chemical composition of the material, possibly destroying any biosignatures, or chemical signs that could imply the presence of life. To interpret what future space missions find on the surface of Europa we must first understand how material has been modified by radiation. JPL, a division of Caltech in Pasadena, California, manages the Europa Clipper mission for NASA's Science Mission Directorate in Washington. For more information about NASA's Europa Clipper mission, visit https://www.nasa.gov/europa. Photojournal Note: These images were updated on Nov. 12, 2018.